CORRECTION: A previous version of this story incorrectly spelled the name of Jill Levine on the first reference. Updated at 7:17 p.m. on Monday, April 15, 2019. Sen. Todd Gardenhire, right, listens to Sen. Bo Watson Tuesday, January 5, 2016 at the Chattanooga Times Free Press. NASHVILLE — He's sponsored any number of his own school voucher bills over the years, but Republican Sen. Todd Gardenhire of Chattanooga says he intends to vote no this week on Gov. Bill Lee's controversial, voucher-like "education savings account" proposal. "A week and a half ago, the governor asked to meet with me on another bill," Gardenhire said. "I told him I was not for the voucher bill, but I'd carried every voucher bill for the past six years. But this was one I could not go along with." His comments come as a blow to Republican Gov. Lee's ESA bill which is scheduled to come before the 11-member Senate Finance Committee on Tuesday. Gardenhire was seen a sure yes vote. Legislative observers say the bill was already facing a potentially tight vote. Gardenhire sits on the committee as does Sen. Bo Watson, R-Hixson, who is the panel's chairman. There are questions about Watson's support. Efforts to reach him on Sunday were unsuccessful. 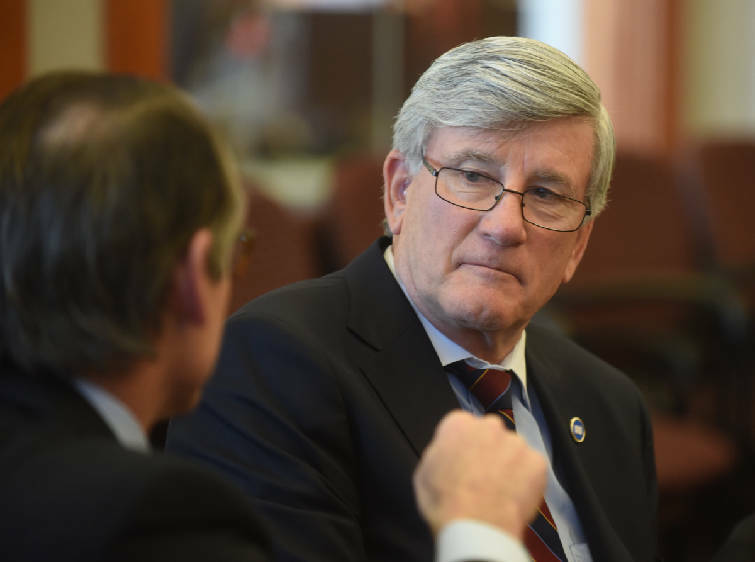 Sen. Gardenhire said his primary objections include Lee administration amendments to the bill that aim to keep undocumented immigrant students out of the proposed ESA program. "As you know, I've been a big proponent of making sure they get an education they're supposed to get," said Gardenhire, who has fought over the years to let undocumented immigrant children living in Tennessee pay in-state tuition rates to attend public colleges if they are in the federal Deferred Action for Childhood Arrivals program. "And [Lee] and I have a fundamental disagreement on that." Secondly, Gardenhire said, are the considerable efforts that he, Watson and Rep. Mike Carter, R-Ooltewah, went to a few years ago to help Hamilton County schools. At the time, the senator said, then-Gov. Bill Haslam and Education Commissioner Candice McQueen "wanted to swoop in on the Hamilton County Schools system and take over the priority schools." "I went to the governor and Candice and asked them if I could try to figure something out," Gardenhire recalled. "Then I went to [Superintendent Bryan] Johnson and Jill Levine and met with them and asked them what they could live with and what they were willing to do." With Watson and Carter joining the effort, Gardenhire said, local education officials and McQueen's office worked on a plan that eventually led to creation of Hamilton County's new State Partnership Network. The collaborative effort between the state and county system seeks to provide special focus and aid for students attending the county's five worst performing schools — Brainerd High School and the four schools that feed into it. "They really want to make this thing work to fix those priority schools. And if we don't give them a chance, then we've done a tremendous disservice," Gardenhire said. "I asked the governor [Lee], I said can we exclude Hamilton County and add another county in it? And I'm not going to speak for him, but I know what his answer was." Pressed by a Times Free Press reporter, Gardenhire said Lee "didn't want to go do that." "Nobody asked any of the legislators at all that I know of for any input," Gardenhire said. "They just decided just to come up with this plan." Lee's press office had no comment on Sunday. The governor unveiled the ESA proposal in his first State of the State address in March. He's asking lawmakers to approve a program which would spend up to $125 million in state and local taxpayer dollars by Year 5. It would allow parents living in a school district with at least three schools falling into the state's bottom 10% to send their children to private schools or for home schooling. But the students wouldn't actually have to be zoned to attend a low-performing schools. The program impacts Hamilton, Knox, Shelby, Metro Davidson and Jackson/Madison County school districts. It also would include the state's Achievement School District which had taken over a number of failing public schools. The average award amount per student would be about $7,300. Following revisions to the bill, eligibility would be based on double the family income to qualify for the federal free lunch program. That's $65,260 annually for a family of four. House and Senate bills differ in a number of respects. In an effort to smooth over House Republican concerns, the program is capped at 15,000 students. But the Senate version sets the cap at 30,000. Both bills have provisions requiring parents to provide documentation such as a driver's license, Social Security number, child's birth certificate and other official papers. Proponents say that's to ensure auditors can identify families when checking how they spend the money. Critics of the legislation says it's a blatant effort to keep out undocumented children. Lee acknowledged as much to reporters recently when he said "we're going to make certain that we provide that to legal residents of Tennessee." Other provisions of the bill would provide impacted school districts a combined $25 million annually over a three-year period to systems for loss of students. The state's Basic Education Program funding formula distributes school funding on a per capita basis. In future years, Lee has promised, the state would continue sending the $25 million to the public systems but it would have to go toward improvements in the bottom 5% of schools. A number of people thought Watson would be a yes on the ESA bill. But in a recent online op/ed on a Chattanooga news website, Shaka Mitchell, executive director of the pro-voucher, pro-ESA Tennessee chapter of the Washington-based American Federation for Children, appeared to be in doubt on that point. Resting his argument on Gardenhire's presumed support to persuade Watson and two other Republican lawmakers from Hamilton County, Mitchell wrote "it is my hope that other Chattanooga area legislators, including Senator Bo Watson, Rep. Patsy Hazelwood, and Rep. Esther Helton join with Senator Gardenhire and Rep. Robin Smith in supporting the Governor's ESA legislation." The legislation is Senate Bill 795/House Bill 939. House Finance Committee members are expected to take up the bill Tuesday as well. Hazlewood, R-Signal Mountain, is vice chairman of the panel.